Another day, more work done, but hey I've been having a great time. 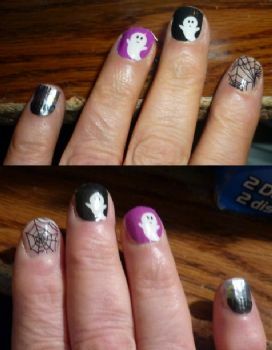 I got all the emails, calls done for the CAMDEN events so far, and I even had the chance to put my Jamberry Wraps on, I love them, I'M NOW OFFICIALLY HALLOWEEN READY!! On my thumbnail is a skeleton, and some of them GLOW IN THE DARK!! How can I go wrong. Tomorrow I have to do most of the baking/cooking because the things I have to make can't be done ahead of time. So I'm heading over to our Daughter's tomorrow morning to start doing all that, and help her decorate. So exciting. I need to put my "makeup" on before hand, I won't have time to do it there. *LOL* Should be hilarious. Have a wonderful weekend everyone, and thank you all for your wonderful support. Word of the day? Wonderful. 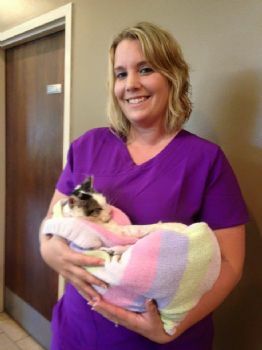 Oh, I forgot, our Daughter's vet clinic used her picture for their site, it's so cute! great pics. have a wonderful week! Great nail art! Have a great weekend. I love your nails. I'm enjoying your getting ready for Halloween almost as much as you are. Thank you for sharing all of the preparations. Great photo of your daughter; lucky animals to have her caring for them. Your nails are so cute!